A few years ago now, one Bill Bryson – master travel writer and well know author of “Notes from a Small Island” amongst other things – came to a realisation. That he didn’t know the first thing about the only planet he was ever going to live on. I’m sure many of us have had similar fleeting thoughts occurring to us from time to time, but in this case, Bryson decided he was going to do something about it. That something turned out to be three years of reading through books and journals, talking to “saintly, patient experts prepared to answer a lot of outstandingly dumb questions” and eventually producing a book that would aim to make science not only accessible to your average reader, but actually interesting. Seeing how many people were bored by or scared off science at school level, this was something of a challenge to say the least. Nevertheless, the book was written and the result of all this work published this year under the rather ambitious title “A Short History of Nearly Everything”. Bill Bryson is undoubtedly a hugely popular writer – I am quite a fan of his and indeed own several copies of his previous works. I’ll own up right now and admit that I bought this book purely on the basis of its author, with only the briefest of glimpses at its content. I know from past experience of reading Bryson’s work that while his travel books have been excellent (with the sorry exception of the lacklustre “Down Under”) his previous dabblings in other fields have been not quite so readable. I found “Mother Tongue” (his 1990 book on the linguistics of the English language) to be rather tiresome, even a bit dull, and it was quite a struggle to read it through. I suppose it was one of those books where you needed a strong prior interest to get anything much out of it. It was with a little trepidation that I began to read A Short History, then. I was hoping that this was going to be classic Bryson, but was aware that I may well have just spent my £11 on something that would do little more than make my bookcase that bit fuller. So what did I actually get for this investment? Well, A Short History aims to cover the full breadth of the sciences in an attempt to understand and explain our world, what we know about it and how we know what we know. This gives us 30 chapters arranged into 7 sections, each of great significance to science – the origin of the universe; the gradual discovery of the age and size of the Earth through history; atomic theory and relativity; the present and future threats to our planet; the origins and history of life on earth, and the evolution of man. This required Bryson to get to grips with subjects ranging from astronomy to palaeontology to cell biology (and pretty much everything inbetween), and to explain them to us in a manner that requires no previous knowledge of science. The text comes generously sprinkled with anecdotes about the scientists themselves, which serves to give A Short History a humour and humanity that is often lacking in science books – a particularly splendid example is where Francis Crick (Nobel Laureate and co-discoverer of the structure of DNA) is noted as suggesting “that Earth was deliberately seeded with life by intelligent aliens”. The first thing that struck me when reading A Short Histor is that Bryson has certainly achieved accessibility in his text. I get the impression that he must have badgered and pestered people until he was quite sure that he understood things correctly – for what you are given here is Bryson’s interpretation of science. That is, Bryson uses his talent and creativity as a writer to make serious science non-technical and less demanding. You are presented with clear and original explanations that go beyond the usual dreary tendency to measure things by lengths of football pitches or volumes of swimming pools. This is Bill Bryson writing at his (almost) best; amusing, pragmatic and slightly irreverent, though not laugh-out-loud funny as his travel writing so often is. Not only did I find things I already knew written about in a more amusing and witty way than I ever thought possible, but also learned a whole load of new stuff. What I would have given for this book when I was taking my A levels! Given that Bill Bryson readily admits to being a non-scientist and was for the most part researching topics from a state of almost complete ignorance though, it is reasonable to wonder about the reliability of the information in A Short History. From my own knowledge, I can quite happily vouch for the geological and archaeological facts presented in the book, and as everything else seems to have been proof-read by experts in an appropriate field, I think we need not worry ourselves greatly on this part. Indeed, coming at this work as an outsider to science may well be a positive thing – as anyone who had studied a subject in depth will understand, it is often difficult to see the wood for the trees as an insider. As I have mentioned, A Short History is a highly ambitious work. Perhaps too ambitious, though. Trying to compress such a huge quantity of material into a short space has left some parts of the book feeling a little too short and too shallow. Anyone who has a reasonable level of knowledge in an area – say, to A level standard, maybe a little less – will be hard pushed to learn anything new from the corresponding section in the book. This is not to say scientists will not enjoy reading A Short History, just that they may find it a bit superficial in places. I do not see this as a major problem, though, as after all, this book is aimed squarely at the layman and it not intended as a textbook. The proportions given to certain areas was another little niggle that got to me, though. Whilst Einstein gets an entire chapter, extinction is relegated to just a couple of pages in the final chapter, leaving the book feeling just a little unbalanced in places. So do I recommend this book? A big yes to Bryson fans and non-scientists, but not so much to the more scientific amongst you, and an outright no if you are of a nervous disposition. Why? Because the destruction of the Earth (or at least of human civilisation) is a continuous and recurring theme throughout A Short History. If you are the sort of person who wants to hide under the bedclothes at the mention of your future demise, you may not wish to read the cheerful relish with which Bryson discusses supervolcanoes (namely the active one under Yellowstone Park), meteorites hitting us (of which we would have little or no warning) or that HIV may one day mutate so it can be transmitted via mosquito bite. 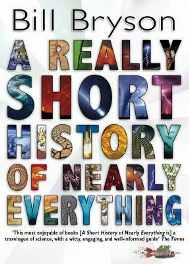 A Short History of Nearly Everything (2003), published by BCA. No Comments on "Life, The Universe and Everything"